Golf for Beginners Podcast 02-26-06 takes listeners deep inside the Battle of the Sexes debate. The latest Golf for Women Magazine recently surveyed men and women to hear their thoughts on this ongoing debate but Barry and I put our own spin on this "Adam versus Eve" battle. As more women learn the sport it doesn't appear as if this conflict will ever be solved but it sure is fun talking about it! In our Tour Talk section we discuss the elimination of the top golfers from the Accenture Match-Play Championship this past weekend. Tiger Woods and Phil Mickelson were downed early in the tournament and Ernie Els didn't even make it past day-one. Vijay Singh had no better luck. In fact Australian Geoff Ogilvy creamed Davis Love III in the finals to join Craig Parry as the only other "down-under" golfer to ever win at the World Golf Championships. On his way towards the finale Ogilvy had to defeat such top golfers as Michael Campbell (U.S. Open winner), Mike Weir (Masters), Tom Lehman (British Open) and finally Davis Love III (PGA Championship). "Unbelieveable!" Ogilvy exclaimed. "It's such a hard tournament to believe you're going to keep going. I got lucky the first four days and the last two games I played very well." Ogilvy takes home a huge paycheck of $1.3 million but more importantly Ogilvy moves into the top thirty on tour and has a chance to play in the season-ending Tour Championship. In LPGA news, Michelle Wie strutted her stuff at the Fields Open in her hometown of Oahu. Although she didn't win, Wie showed the world that at sixteen she is more than capable of holding her own alongside of the best female golfers in the world. While Meena Lee and Seon Hwa Lee duked it out on extra holes, Morgan Pressel came in with a disappointing eleventh place finish alongside of Paula Creamer. Although Natalie Gulbis led early on, she just couldn't keep the lead, finishing in a tie for fourth place with Lorena Ochoa. Both of these ladies now have their second top-ten this season. Wie takes home her first professional paycheck of over $73K. She also gets to show off her new diamond-encrusted Omega watch given to her as part of her latest endorsement deal. I wonder what the kids at her high school will think of it? At least we know that Wie is thrilled with her new Omega. Here is what the 16-year-old was thinking about during her final round. She was asked, "How closely were you following what was going on at the end there with the leaderboard and the changes?" Michelle Wie's reply sounded typically teenage. "Not really that closely. Basically I was checking out what time it was. My watch is so cool. I was asking my caddie, 'Do you know what time it is?' The scoreboard, I didn't pay that much attention to." Also make sure to tune in for our latest golf tips, served up fresh weekly by Barry. He is always working on his game and shares his tips for playing smarter, not harder. Putting tips for saving strokes are also discussed. For questions and comments please feel free to email us at golfforbeginners@aol.com. The best of the best on the LPGA Tour aim for both the second win of the season as well as amassing more points to gain exemption into the final hurrah of 2006, the ADT Championship. Michelle Wie will use her first of eight exemptions this week on her home turf in Hawaii. The 16-year-old will most certainly be the youngest and most popular golfer in the field with a close second belonging to her nemesis Morgan Pressel. Pressel soundly defeated Wie several years ago in match play format at the AJGA Championships and recently has been outspoken about Wie's easy entrance into LPGA tournaments through exemption instead of by earning her spot. Expect sparks to fly at this inaugural event. At the Fields Open it's not all about the trophy, points or even the share of a big $1.1 million purse. This week it's personal. Only a hop, skip and jump from Turtle Bay Resort, Ko Olina Golf Club in Kapolei, Oahu is the second stop on the LPGA Tour. For over a week the ladies have been sunning themselves during their off-time but now it's back to business. Although most of the same ladies have made the short journey this week there is another amongst them making her 2006 debut who has single-handedly changed the face of women's golf. Michelle Wie's long flowing swing has been compared to Ernie Els, earning her the name "The Big Wiesy" among players on the PGA Tour. Hot debates on the internet have created a whirlwind of controversy contending that Wie should first play golf on the LPGA before teeing it up with the men of the PGA Tour for the experience. The time is at hand for Wiesy to strut her stuff. Michelle is ready to show that she can certainly compete against the best of the LPGA and hopefully put a victory under her belt. Attempting to stop her will be 132 women, all believing that they are as good or better golfers than Wie and that she is just lucky in her business ventures. Morgan Pressel has already defeated Wie, albeit several years ago and has even one-upped Wie as recently as at last year's US Women's Open, sharing second place with Brittany Lang after failing to win at the 18th hole against a lucky sand save by Birdie Kim. The stakes are higher this year as Wie has to prove she is worth the millions of sponsorship dollars thrust upon her. Pressure is mounting for the 16-year-old to perform at a higher level given her attempts to make the cut at several Sony Open's on the PGA Tour. Maturity, or the lack thereof, will show itself this week as a few of the top performers are barely out of high school. From top: Morgan Pressel, Paula Creamer, Michelle Wie and Brittany Lang all appear this weekend at the Fields Open. Take for example last year's Rolex Rookie of the Year Paula Creamer who struggled last week at the SBS Open. The 19-year-old from Bradenton, Florida has the ability to make it to the top of the money list. She finished in second place last year, just beneath Annika Sorenstam in the standings but could not get a top-ten last week. Still, she is a top choice to win this week, and she rarely pouts. Natalie Gulbis is a bit older than the others at 23-years-old. She is a grinder and with the assistance of swing coach Butch Harmon may well 2006 her breakout year. Joo Mi Kim, unlikely winner at last week's SBS Open will try to make it two-for-two this week but Lorena Ochoa's playoff attempts have not gone unnoticed. Last year Ochoa quietly climbed the official money list despite a few snowman blips and chokes along the way especially when facing off against Annika Sorenstam at the Mastercard Championship. Speaking of the Mastercard, Sorenstam will wait until this event to make her 2006 debut, so fans of Annika please be patient! And I'm still waiting for Q-School champion Ai Miyazato to garner a top-ten for herself. She has played in the Women's World Cup of Golf early this season and now at the SBS Open with mediocre results. I'm betting that once she starts winning, Miyazato will be unstoppable. But my opinion here doesn't really matter. Ai haw a huge following out in Japan and is as popular as Tiger Woods! Between her sponsorships and followings, Miyazato needs a win desperately! Expect to see regulars Laura Davies, Dorothy Delasin, Juli Inkster, Cristie Kerr and Christina Kim grinding it out this week as well. There will also be a huge Asian contingency at this event. Eight sponsors exemptions have been given out, all to Asians. What are the odds that an Asian will win this weekend? Will Morgan Pressel eat her words about Michelle Wie? Find out the answers to these burning questions this weekend. The Golf Channel will air the Fields Open on February 23-25th from 6:30 to 9:00 p.m. (EST). If you are a true golf fanatic, you surely don't want to miss this spectacular 54-hole event! Photo Credit: © AP Photo/Katsumi Kasahara. Will Tiger Woods Play the Champions Tour? Golf for Beginners Podcast number fifteen looks at both the serious and silly sides of golf. Before we begin, please make sure that you tune in to our podcast next week as there is something happening to both Barry and I as well as Golf for Beginners that is going to change our future and we want our listeners to celebrate along with us! Now, on to the podcast! There is plenty of news this week beginning with the first LPGA event of the year, the SBS Open which took place in at the Turtle Bay Resort in Hawaii. This is the same resort which hosts the Big Break V:Hawaii and the thrills are equally as great. Korean rookie Joo Mi Kim grabbed the first place check of $150,000 from opponents Lorena Ochoa and Soo Young Moon in an unlikely playoff. The good news is that Kim WON the event with a birdie in the second playoff hole as opposed to the other two handing her the trophy. Morgan Pressel displayed her skills admirably in her first professional event. Morgan shared fifth place with Natalie Gulbis. Paula Creamer didn't fare as well, unable to stay in the top-ten but give her time. She wasn't handed her first official tour trophy until the Sybase Classic and then she just couldn't be stopped! These ladies all have one thing in common, namely, big business is standing behind them, offering contracts for all kinds of sporting goods. USA Today writes about the marketability of these young superstars. General manager of Nike Golf USA, Cindy Davis states, "We believe these players can create brand awareness. There has been an evolution of women in sports in general. Their acceptance has changed dramatically in the last 20 years." Twenty years ago the ladies in the LPGA were hard-pressed to find sponsors. Today, the younger, attractive stars are naming their own ticket. Morgan Pressel represents Callaway Golf and Paula Creamer has six contracts from big names such as Bridgestone and TaylorMade-Adidas. Q-School medalist Ai Miyazato has really hit the big time in Japan. She is such a larger-than-life superstar that she can't go outside without being chased down the street for an autograph. She's bigger than Hideki Matsui, has eleven different sponsors and is a television star to boot! When she is exxpected to play in a JLPGA tournament, ticket sales triple! 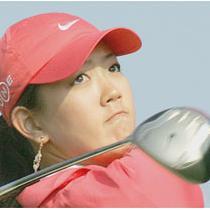 Michelle Wie is a prominent example of the new breed of woman golfer. Her combined $10 million Sony/Nike deal exemplifies capitalism to a "tee". A large, golden tee, that is. These days it's no longer just about a win on the LPGA Tour. If a girl is marketable, she'll be brought along and has a good chance of retiring with a golden parachute. In Champions Tour news, Loren Roberts secured both his third trophy and a place in history this week at the ACE Classic. Roberts is the only senior tour player who has achieved this feat and he did so in exciting fashion. And would someone please purchase an umbrella for Tiger Woods! With flu-like symptoms, Tiger had to withdraw on Saturday after being drenched after a rainstorm at the Nissan Open. This is the only tournament which Woods has played in more than three times that he has not won (at least once). His record remains unbroken. However, even with the sniffles, Tiger can drive the ball farther than most professional golfers today. His average drive for two days at the Nissan Open was over 300 yards which put him in ninth place in driving distance. But how will Tiger fare playing golf with the seniors? In our Blogger Weekly section we pit Vijay Singh against Phil Mickelson in a Celebrity Deathmatch. Vijay just doesn't know when to give up! He's now two-for-two in calling officials over to check Mickelson's equipment and he loses each battle. Also, eatgolf.com is convinced that food and water are overpriced at the Riviera Country Club. We don't agree. Notoriously, sporting events charge exorbitant prices because they can get away with it. We also talk about the importance of a good golf instructor. These professional instructors are invaluable if you are serious about your game. Most importantly, Barry and I have BIG NEWS heading our way. We are thrilled and excited all at once. Keep listening for all of the details! For questions and comments please feel free to write to us at golfforbeginners@aol.com. We'll discuss your email in our podcast. Wie and Pressel in Celebrity Death Match? Morgan Pressel and Michelle Wie duke it out! Thegolfblog.com quoted Pressel as saying, "I don't think she (Wie) needs an exemption. I've been through qualifying. Everybody who doesn't make it on the money list, other amateurs, other professionals that aren't members of the tour, they all have to go through qualifying, too. 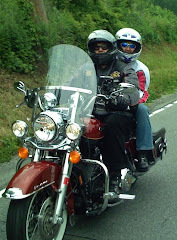 I don't see why she shouldn't, or why she should be afraid, or expect an exemption." This week's "Blogger Weekly" had a field day with this one, quoting bloggers who agree wholeheartedly with Pressel. Of course Wieblog.com fought back claiming, "Teenage girls can be so catty… about LPGA exemptions. Wie earned her Women’s Open exemption because her virtual winnings in events she participated in would have put her into the top 35 on the LPGA money list." MEOW! This readers, is great for professional women's golf. More interest creates more advertising dollars which fuels the sport. I'm really happy about that and will continue to report on this subject and on women's golf in general. My personal opinion tends to agree with Pressel but allowing Michelle Wie to play in such a venue would undoubtedly increase appeal in the LPGA. Purses will increase and the ladies sport will continue to gain momentum. Just look how much interest was generated when Michelle Wie played golf at the Sony Open? Our question of the day comes from Karl at justsayok.net. He asks, "When do you consider yourself a golfer?" Check out our response and think about when you officially became a golfer. 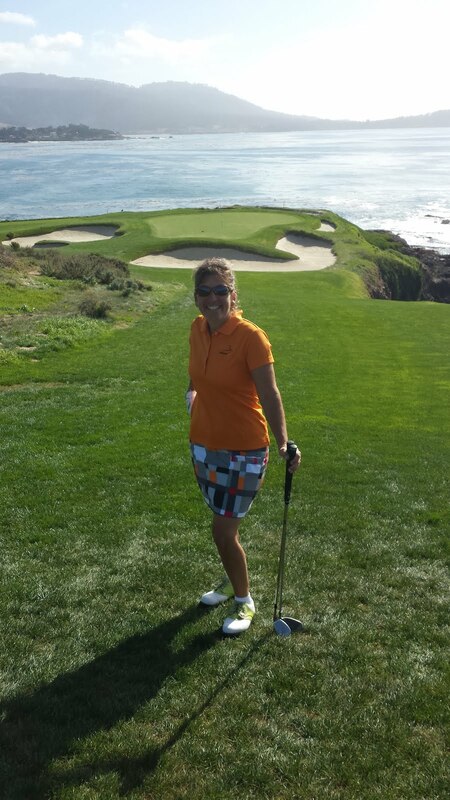 We also talk about the Pebble Beach Celebrity Pro-Am. Although Phil Mickelson won wire-to-wire in 2005 he wasn't so lucky this week. He wound up with a 77 in final round action. This wasn't his best event and I sure hope Phil watches the tape and corrects his mistakes. The Masters is coming up in the blink of an eye. And just a few handicaps which might intrigue our readers. Our favorite player at the Pro-Am was undoubtedly Bill Murray who actually enjoys this tournament and isn't afraid to show it. His clothes fit his mood and his 14 handicap is very respectable. Murray has a membership at Sleepy Hollow CC right down the road from our house and although we have taken lessons there before, we haven't played golf there yet with Bill! And, did you know that Olympian downhill skier Bode Miller plays to a 10 handicap? Check Out Stacy's Golf Swing! 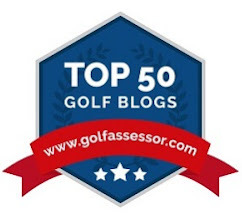 It's time for all of my readers and listeners to see the golf swing behind the blog. It's early in the season and this is my first time at a driving range but I think it's worthy of a visual. All I can say is thank goodness for my impact bag. Isn't it amazing how much stuff we golfers collect around the house which we hardly use? The impact bag has long been one of my favorite training aids but has been sitting around lately gathering dust. I personally think that my golf swing looks pretty good! If you have a video camera it is always a good idea to bring it with you to the driving range. Although you may not notice a flaw in your swing upon first inspection, I think that you will be able to compare it to other professional golf swings and notice a difference. It might also be in your best interest to take the video you create over to a professional golf instructor so he/she can evaluate it for you. I'm taking my movie (and my golf swing) over to my swing coach, Bill Moro, for an evaluation. I have one lesson remaining in my group series before I have to purchase another set. If you are serious about the sport and want to take lessons it might also be a good idea to purchase a set of four or five of them. Not only does it come out cheaper but it may take a few lessons to ingrain that new, improved swing into your practice. Tiger Woods in the 2008 Olympics? "Should golf be an Olympic sport?" People's Daily Online, a Chinese online periodical in English quotes Secretary General of the China Golf Association, Cui Zhiqiang as saying that the decision, "made sense as the game was becoming increasingly popular in China with about 200 courses and 200 more under construction." Golf has been on the Olympic program twice, in 1900 and 1904. There were two golf events in 1900 - one for men and one for the ladies. GolfToday.uk added, "They gave away gold medals for synchronized diving, beach volleyball, fencing and badminton at the Olympics in Athens. The world's best basketball players were there (minus several American defections), along with stars in softball and tennis. There were 28 sports involved, but no golf." Previous Olympic sports have included Tug-of-War, Polo, Rugby, Lacrosse, Cricket, Croquet and water-skiing. I think it's about time that there were some form of amateur form of golf at the 2008 Olympics but it won't be feasible if professionals are allowed to play because the USA will undoubtedly win gold (who could possibly take a gold medal from Tiger Woods?). This week's "Blogger Weekly" section focuses on yet another left-handed golfer, Gerry "Bubba" Watson. We are possibly looking at another John Daly. Bubba stated in http://www.golf.haabaa.com/blogs/?p=68, "If it ever comes down to where I need a lesson, I’m quitting. I’m never going to have a lesson. People say, ‘Quiet your hips,’ and I don’t have a clue what they mean. I just hit it." Bubba's longest recent drive? Over 422 yards in 2004! And finally, Barry and I discuss how using a video camera at the driving range could show you hidden flaws in your swing. 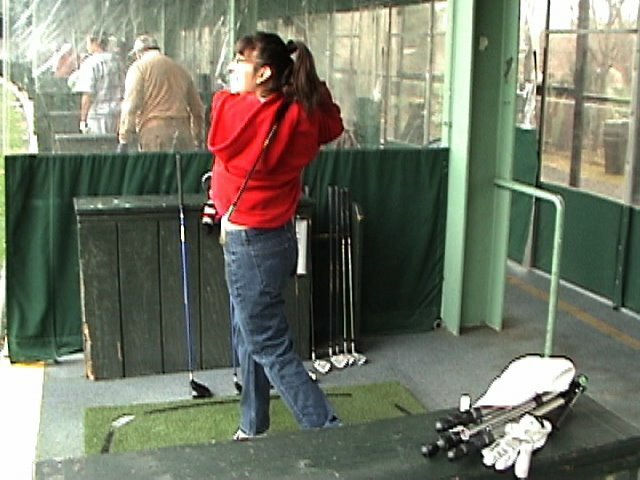 We took a camera to the range and taped my swing so look for my swing video in this week's blog. Our Service Station Gets a Facelift! While Barry plays golf our Amoco station rejuvenates. Today is our anniversary. Fourteen years of marriage to the same guy. Has it really been that long? It's also a holiday…Groundhog Day. I don't remember the last time Punxsutawney Phil did NOT see his shadow so prepare for six more weeks of winter! In honor of this special day I'm making sure Barry plays a round of golf with his regular foursome. 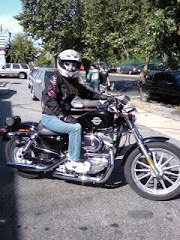 I personally haven't had much luck getting out to play this winter sigh. It seems as if every time I feel the need to get out the weather fails to cooperate. When I hear that one day of the week will be just right, I make sure my husband gets to play first. I think he needs it more than I do. I'm also being a bit selfish because I know that if I don't make a stink when he goes out, he can't berate me for something that I might want to do. I, on the other hand, require a warmer day. My time out requires near perfection. Nice weather and plenty of sunshine. Barry was the person who helped me to learn the game that I now can't get out of my blood. I can honestly say that I had no interest in the sport until he told me that I didn't necessarily have to play at the crack of dawn. That was the decision-maker for me. Another great thing that Barry made me do was to take lessons from the moment my first set of clubs were delivered to me. That actually made golf not only more enjoyable but also made me realize that I was a natural ahem at it. This season marks my fifth anniversary of playing golf and I'm regularly in the 80's. My swing is compact yet flowing and as time progresses, it gets more powerful. My promise to videotape it still stands as soon as warmer weather hits and I come out of hybernation. Of course my husband's play time means more stressful work time for moi. As many of you may know, Barry and I own and operate a service station. Not only is it our anniversary but tomorrow also marks the last day of our Amoco station and our changeover to Getty. So next year will be "Happy Anniversary to us and to our service station"! Signs will be coming down, new ones will be hoisted into place. Barry will miss all of this commotion because golf is much more important to him than watching a couple of new signs go up. Am I happy with the changeover? Yes and no. There were two main reasons why we were forced to make the switch. For one thing, we're not a "mega" station. 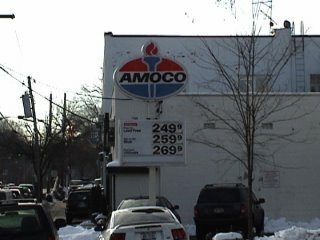 Amoco (now BP) wants only larger gas stations that can offer 100,000 gallons or more per month, every month. Our "mom and pop" store can't do even half that amount. The second reason is that they have added a surcharge to our delivery making the gasoline unaffordable to sell. We don't make much money on gasoline anyway but this was like taking every last cent out of our pockets. Not going to happen, ergo, we switched. The good news is that we got to select the type of branding. We were offered several different gasoline companies but Getty seemed to be the one that offered us lower prices with the quality of gas remaining unchanged. Getty is pretty good stuff and it comes from Russia. Okay, take your pick. The Saudi's or the Russians. I'm going to post some of the pics here as soon as I can take them so everyone can see our "new and improved" gas station.